This Web-site of ElectronicTender.com (India) Pvt. Ltd [ElectronicTender®] may be used for informational purpose only. By using the site in any manner or downloading material from the site, you agree to terms and conditions set forth herein. may refer to names of actual companies, their products/ services and logos which may be the trademarks of their respective owners. ElectronicTender® assumes no responsibility and makes no representations regarding the accuracy of the information that is furnished, and provides no assurances that any problems referred to may be resolved by use of the information provided. ElectronicTender® makes no representation that any information contained in this site is appropriate for use in any location/ territory globally where such information may be accessed but may be prohibited under local laws. Information published by ElectronicTender® on the web site may contain references, direct or indirect, to Electronic Tender's products and services. It should not be construed from such references that all such products and services are available in every location/ territory form where such information is accessed. Availability of a product or service should be specifically confirmed by checking with ElectronicTender® or with its authorized Marketing Partner in your location. The recipient of the information must take necessary precautions to guard against any forms of viruses, worms, or any other items of malicious/ destructive nature in any form which may afflict the internet/ web-sites from time to time. ElectronicTender® is not responsible or liable for any such aforesaid material of malicious/ destructive nature in any form. ElectronicTender® is also not responsible for any obscene, threatening, defamatory, offensive or illegal information/ material or conduct of any other party. ElectronicTender® will not be responsible for any unauthorized access, editing/ alteration of any information/ material submitted by you, nor for the receipt of any information/ material submitted by you or for any transaction made using this site. Use of any information from this or any linked site is at the recipient's own risk. Furthermore, by providing this information, ElectronicTender® does not grant any licenses to any patents, copyrights or any other Intellectual Property Rights in any form. ElectronicTender's responsibility and obligations in respect of its products and services are governed solely by the specific agreements/ warranties under which these are provided. If a product or service is obtained by you from ElectronicTender® through this web-site and that product or service is provided without an agreement/ warranty, then that product or service is provided on "As Is Where Is" basis with no warranties whatsoever, express or implied, and your use of that product or service is solely at your own risk. All information/ material presented by ElectronicTender® is on an "As Is Where Is" basis only. ElectronicTender® provides no representations and warranties, express or implied, including the implied warranties of fitness for a specific purpose, merchantability and non-infringement. Under no circumstances will ElectronicTender® or its authorized Business-Partners be liable in any way for any direct or indirect, special, incidental, consequential damages, or any damages whatsoever arising in any way due to use of this web-site or any other hyper linked web-site, or the inability or delay to use this site or related services, including, without limitation, any interruption in operations, any lost profits/ revenue, loss of any programs or data on your information systems or otherwise. This would be applicable even if ElectronicTender® is expressly advised of the possibility of such damages. All graphics, pictures, animations etc on the web-site are only illustrative in nature and may not depict the actual procedure, product or service. Linked sites may not be under the control of ElectronicTender®. 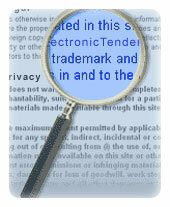 ElectronicTender® makes no representations whatsoever about any other web-site which you may access through this one. Links have been provided to some web-sites purely for your convenience, and in no way does ElectronicTender® endorse or accept any responsibility for the content, or the use, of such web-sites. Similarly, when you access a non-ElectronicTender® web-site which contains information or logo of ElectronicTender®, it should be clearly understood that it is independent from ElectronicTender®, and that ElectronicTender® has no control over the content on such web-sites. We notify you that specific information/ material furnished by you would be publicized or used with your name. Related Copyrights/ Trademarks/ Proprietary Notices should be retained on any information/ material downloaded. You will not intrude/ hack or attempt to intrude/ hack into this site in any way. You will not interfere/ interrupt/ modify the operation of this site or its content in any way, or attempt to do so in any way. You will not infect or attempt to infect in any manner the site and its contents, its transmissions and receptions with any form of viruses, worms, or other destructive material, or attempt to do so in any way. You will not post any obscene, malicious, defamatory/ offensive material of any type on this site. You will not use the contents of the site in any manner to offend, intimidate, defame or breach the rights of any person. You will not modify/ reproduce the information/ material in any way and use it for any public/ commercial purpose without the express consent of ElectronicTender®. The various terms and conditions mentioned herein are subject to the laws of the Republic of India and the Courts and Tribunals at New Delhi, India shall have exclusive jurisdiction on any disputes that may arise out of the use of the web-site/ site in any manner. Subject to the various terms and conditions set forth herein, ElectronicTender® grants a non-exclusive, non-transferable limited right/ permission to use this web-site and the information/ material thereon for only informational, non-commercial or personal use. If changes are made to these Legal Terms & Conditions, these will be posted on this page so that you are kept fully informed and updated. You may proceed to use the web-site only if you accept all the conditions delineated herein.